Our Philosophy is "Learning Through Play"
WHAT IS A COOP PRESCHOOL? Parents of Sidney Preschool have the opportunity to participate in their child’s preschool experience helping in the classroom usually once or twice a month. This is a great way to learn from our Early Childhood Educator and to observe our children in a social setting. Our Preschool offers excellent adult to child ratios. Class ratios include 1:5 with mostly 3-year-olds and 1:6 with mostly 4-year-olds. We are committed to making a difference in our community. Every year the children and parents participate in beach clean-up days, giving back to the local food bank and creating family events for the whole community. 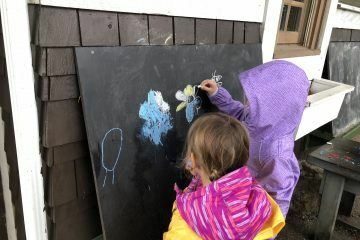 Sidney Preschool is a great place to connect with other families who value education, community connections and community involvement. We come to rely on one another during our time at the preschool and we continue to support one another long after our children move on to elementary school. Sidney Preschool is bright, spacious and well-equipped with age-appropriate toys, supplies and equipment. The outside play area is complete with a large sandbox and playhouse, and has tons of space to run, ride bikes, and play. Sidney Preschool is a nurturing place for our children to play, explore possibilities and reach their potential. They enter primary school confident, self-reliant and ready for new challenges. We love to keep everyone up to date with our exciting news via our blog!